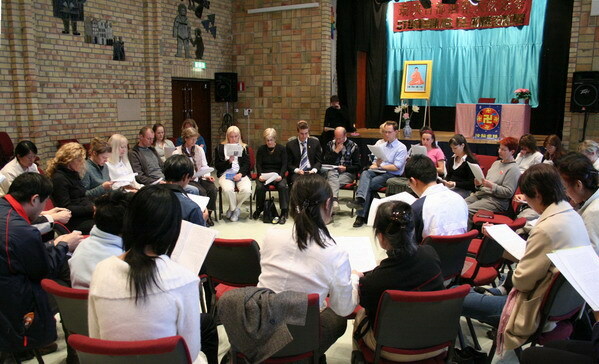 To commemorate the eighth anniversary of the peaceful April 25th appeal, Swedish Falun Gong practitioners held an experience sharing conference in Stockholm on April 28th, 2007, in which thirteen Chinese and Western practitioners shared their personal experiences in cultivation and raising awareness of the persecution of the practice with other participants. During the conference all the participants paid full attention to the experiences shared by others and gave them warm applause from time to time. It fully demonstrated Dafa practitioners’ special cultivation way in which they learn from each other and encourage each other so as to make progress together. Some practitioners said that after listening to others’ cultivation experiences, they found that most Dafa practitioners have become more and more mature as they not only do the three things required by Master Li well, but they can also look within to find their own shortcomings and look at the problems they encounter based on the Fa. In this regard, many practitioners were moved to tears by Master Li’s great compassion. Western practitioner Hassa shared with other participants how he has persistently persevered in distributing the “Nine Commentaries on the Chinese Communist Party (CCP)” to Chinese tourists at tourist attractions. Iranian practitioners Gulli talked about her cultivation experiences in the past eight years, what she has enlightened to during the process of translating the Iranian version of Zhuan Falun, the main book of Falun Gong, as well as the miracles she has personally experienced. Another western practitioner Tobias mentioned his experiences in getting involved with the media and the difficulties he has encountered. He stressed the importance of studying the principles of Falun Dafa well, saying that only by studying the principles well, can he really do his work well. In addition to formal experience sharing, they also participated in a group study of the principles and an informal experience sharing session. The Experience Sharing Conference concluded successfully at about 7 p.m., and all the participants were touched by the experiences shared by others. Many practitioners found their own shortcomings and encouraged each other, hoping to progress holistically so as to help more sentient beings. 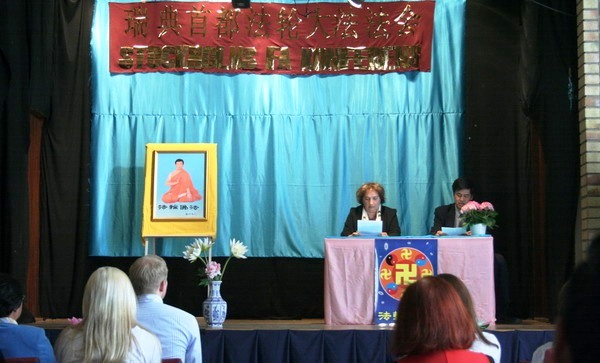 The following day, practitioners got together at the Wasa Museum in Stockholm to practise the Falun Gong exercises and expose the persecution together. As the weather was fine that day, many Chinese tourists visited the museum. Many of them were surprised to find Falun Gong practitioners there. 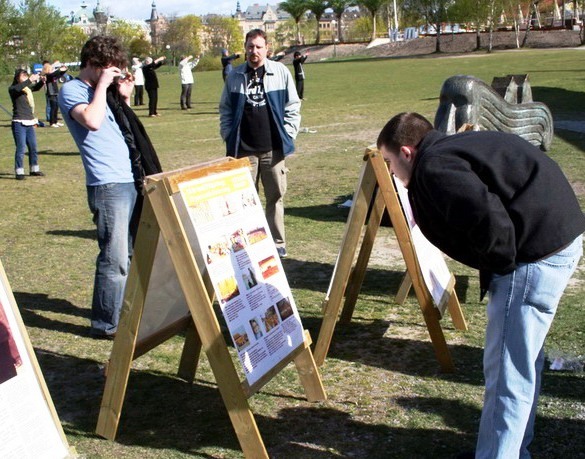 Some of them took pictures of the Falun Gong practitioners again and again. Another man told the practitioners that his mother is also a Falun Gong practitioner, so he videotaped the activities there for her. The practitioners thus asked him to relay their greetings to his mother. He nodded his head repeatedly and said that he would definitely do that. Those who have been seriously poisoned by the CCP dared not to accept information materials. A Chinese tourist pointing at a man in front of him asked a practitioner, “Do you know who that person is?” “He is our party secretary.” The practitioner thus rushed to him and said, “You might as well read the ‘Nine Commentaries on the CCP.’ I think you should remember the former general secretary of the CCP Hu Yaobang and former Chinese president Liu Shaoqi, and know their destiny. The man stubbornly said that he didn’t want to read the book. The practitioner thus kindly told him the lyrics of the song “Finding Truth”: “When disaster descends, it favours neither rich nor poor. But there is a way out Quickly find what is true!" The practitioner also said: “As the truth is right here, you should not miss this golden opportunity to know the truth, though you are in a hurry.” But he just lowered his head and went away silently. Seeing those Chinese who have been deceived by the evil CCP, Falun Gong practitioners especially felt the importance of their responsibility. They said that they would consistently redouble their efforts to clarify the truth to the Chinese people so that they are able to choose a bright future.